Time for Guitar Camp for One again. I’ve neglected my guitars this year and have been playing mostly ukulele. But it’s time to get back studying guitar, practicing my arpeggios and learning new material. One of the things I’ve realized is the variety of approaches to visualizing, understanding and learning arpeggios – not to mention different ways of playing them. This year, while trying to decide what my personal Guitar Camp program would be, I decided to try a membership at TrueFire.com. That gives you access to online videos from most or all of their video lessons you would otherwise have to buy individually as DVDs or downloads. You can download Powertab and PDF transcriptions of the lessons and some have downloadable mp3 backing tracks. A good deal because you can quit anytime. They charge $15 a month for this access. I noticed very different approaches to arpeggios while reviewing a wide range of lesson materials at TrueFire and from other sources. One TrueFire video emphasized the underlying chord forms for the arpeggios. A video on Gypsy Jazz styles had a lot of great ideas. The video discussed both arpeggios from scales but also two-notes-per-string patterns that Django Reinhardt favored. Then there is the Jimmy Bruno approach, who sees all the arpeggios he needs within the scale forms. It should be clear that all of these are useful and correct. They aren’t mutually exclusive. You probably already know a bunch of chord forms so seeing the arpeggios you can play using that chord form as the skeleton is a good way to start. Picking out the arpeggios within the major scales is a bit harder but the rewards are worth it for efficient playing and understanding relationships within the scales. But a next step would then be to pick out the chord forms suggested by the arpeggios you’ve learned from the harmonized scale. Finally, the Gypsy jazz arpeggios for ascending or descending the neck, 2 notes per string, is just a good way to learn how to get from point A to point B on the neck. 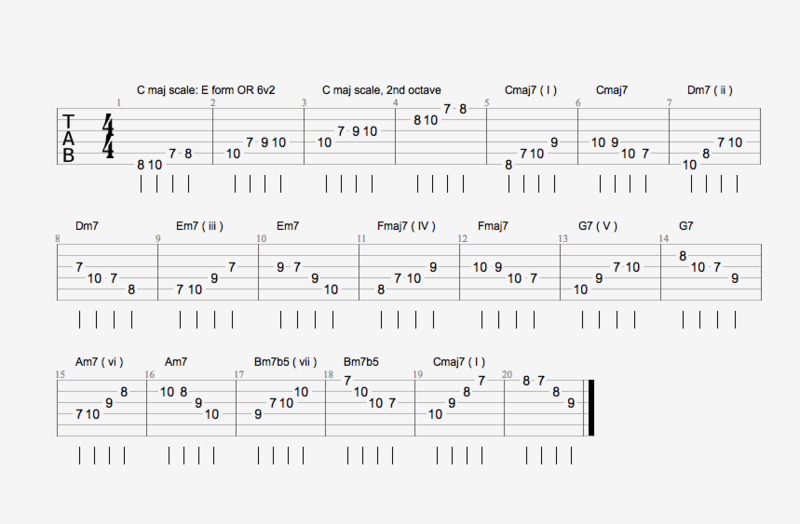 Here’s an example of the harmonized scale played as arpeggios. Can you visualize chord forms for each arpeggio that more or less keep to the notes of the harmonized scale? 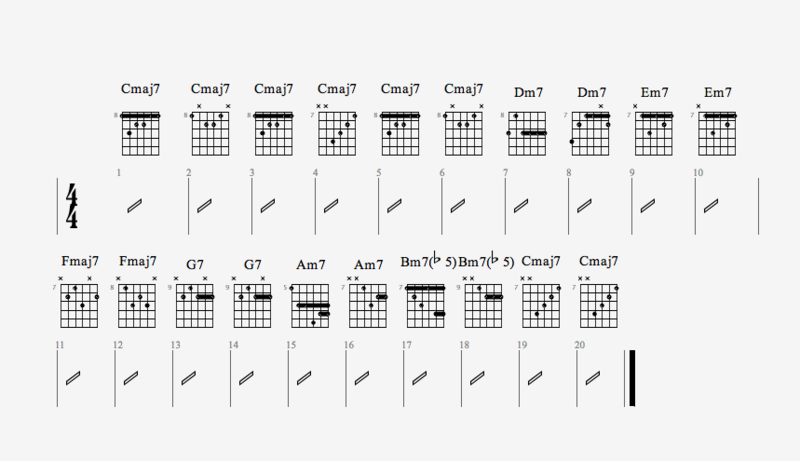 Here are some suggested chords – but you might find others. See above for where the scale ends and the arpeggios begin (arpeggios begin on the 5th bar). These examples are available for download as Guitar Pro and PDF files. Scroll to the end of the article for links. Here’s an example of a two-note-per-string arpeggio for Fm7. If you download the PDF or Guitar Pro files, you’ll find more examples. The only arpeggios that fall slightly outside the scale are to the chords for A7 and E7b9. You can either ignore them and play Am7 and Em7 or you can figure out the A7 and E7 from the m7. Just move the 2nd note of the arpeggio up a fret changing the minor 3rd to the 3rd. Download links for examples are on the download page.